General Motors is recalling an additional 3,896 vehicles to an airbag recall that began last November, which included 2012 Chevrolet Cruze, Chevrolet Sonic and Buick Verano vehicles. The expansion adds an additional 1,981 Cruze sedans, 1,077 Sonic subcompact vehicles and 409 Verano compact sedans. GM’s airbag recall also impacts 205 cars in Canada. The initial recall concerned 2,949 GM vehicles in the United States and 500 in Canada. According to documents filed with the National Highway Traffic Safety Administration, the driver side frontal airbag contains a shorting bar that may intermittently contact the airbag terminals. Such intermittent contact could cause the vehicle’s airbag not to deploy in the event of a crash. Consequently, the risk of injury to the driver is greatly increased. General Motors will begin notifying Chevrolet and Buick customers of the recall on February 13. Authorized dealers will replace the steering wheel airbag coil on affected vehicles, free of charge. In the meantime, owners may contact General Motors at 1-800-521-7300 or visit GM’s Customer Car website for more recall information. Concerned drivers may also call the National Highways Traffic Safety Administration’s Vehicle Safety Hotline at 1-888-327-4236 or visit them online at www.safercar.gov. There are several factors that Chevrolet Cruze, Sonic and Buick Verano owners should keep in mind. Firstly, know where you airbag indicator lights are located. The vehicle’s dashboard will contain a Supplemental Restraint System (SRS) indicator as well as an airbag light indicator, which typically pictures a driver and an airbag. Once the vehicle is turned on, the airbag system will engage in a self-test, illuminating each lamp for about six seconds. If there are no problems, the light will turn off. If the light remains on, there may be an issue and you should contact your authorized GM dealer. GM first became aware of its airbag problem last summer when 15 straight cars exhibited an airbag failure notice. The automaker was then able to trace the issue to a supplier plant problem. GM issued its initial recall before most defective models made it to showrooms. There have been no crashes or injuries reported, according to GM. The airbag expansion recall comes in the same day as the automaker recalled 8,519 model-year 2013 Chevrolet Malibu vehicles in the United States over a rear suspension problem. According to GM, certain Malibu sedans may contain one or more improperly tightened rear suspension bolts, which may lead to loss of handling and increase the risk of a crash. The Malibu suspension recall also affects 1,060 models in Canada, Mexico and elsewhere overseas. General Motors also issued a separate airbag recall last year on the 2013 Chevrolet Malibu Eco in 2012. The safety recall, which affected 4,304 Malibu sedans, was issued due to a sensing and diagnostic module (SDM) problem that could cause sudden side curtain airbag deployment. I have a 2013 Buick Verano my airbag light continually comes on saying service airbag.I see where there was a recall why was I not notified of this airbag recall. 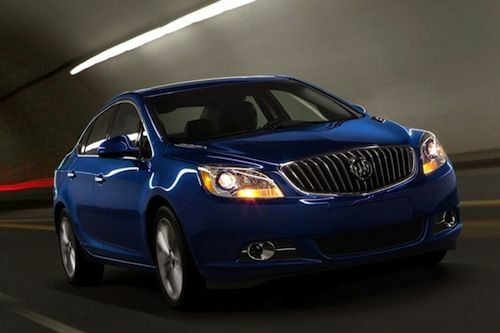 I have a 2013 Buick Verano also and my light has started to come on. I haven't been notified either about the recall. I have a 2014 Buick Verano. My service airbag light keeps coming on also. I took vehicle to Dealership and was told that it was most likely caused by plug in lighter for phone. (REALLY!!??) Since then I have removed my phone charger and recorded my son sitting in the front passenger side (165 pounds mind you) and the sensor shows passenger bag off then service airbag light comes back on. Obviously Buick/GM needs to have this corrected immediately. I have a 2014 verano, n my airbag light been coning on n off lately. Going to get it serviced hopefully! I have a 2015 Verano and got rear ended hard yesterday. After impact and no airbag deployment, the dash said "service airbag system" I'm furious. I have had my 2014 Buick Verano for 6 months - the passenger service airbag light comes on AFTER someone sits in the passenger seat. I usually drive alone,but have noticed if I have a passenger, the light will come on AFTER they have gone. It will come on intermittently for about a month and then not at all... until the next person sits there. Does anyone know if this means the airbag will NOT deploy if there is an accident? Shouldn't this be a safety recall? I did enter my VIN at the NHTSA web site, but it says there are no recalls on my car. I now hear a humming noise when i press on the gas petal, very aggravated, n when pulling out of a parking space, n straighten up the wheels i hear a thump noise. Whats going on in these buick veronos, i should have known better, buick n 4 cylinder shouldnt even be in the same sentence!